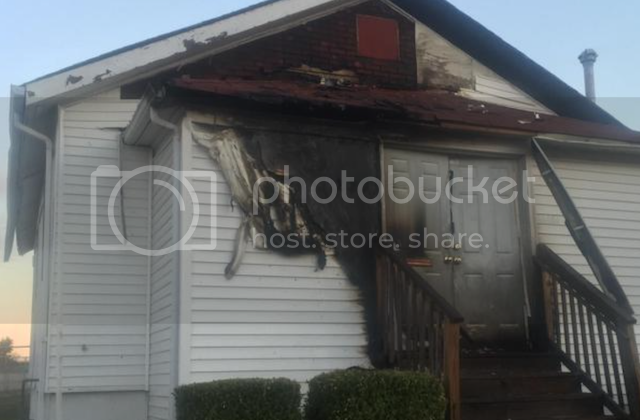 A fire started at a St. Louis area church Thursday became the seventh church to be torched in a two-week period. The front door of the Shrine of St. Joseph was set ablaze with a small amount of accelerant early Thursday morning. St. Louis Police Chief Sam Dotson said an officer spotted the fire at the Catholic church near downtown St. Louis while responding to an alarm at the church. The church is located in a relatively secluded neighborhood near downtown, Dotson said, adding it appeared the person who set the fire had scouted the area and knew they could get in and out without possibly being seen. Authorities said an emergency responder used a fire extinguisher to stop the flames on the wooden front door. No one was injured, said St. Louis Fire Chief Dennis Jenkerson. While the fire was started in a similar manner as the other church fires, this one differs in that it was set near downtown St. Louis. The other fires occurred in the northern part of the city and county in a 3-mile area. The congregation at the Shrine of St. Joseph is predominantly white, while the congregations of the other churches have been predominantly black. Jenkerson said Thursday that the blaze at the Shrine of St. Joseph was "very similar" to the other church fires, speculating that the attacks could be motivated by a disagreement or mental illness. Fire Capt. Garon Mosby, a spokesman for the department, has said the possibility that the fires are hate crimes — for religious or racial reasons — "is part of the dynamic" of the investigation. "We don't know at this time," Jenkerson said. No one was inside the churches when the fires were started. The damage from the fires ranged from virtually nothing at one church to the near destruction of another. Earlier, fire officials said that someone who might be struggling with stress in their life is attempting to send a destructive message to area congregations. Bethel Nondenominational Church, Jennings, Mo. New Northside Missionary Baptist Church, Jennings, Mo. Ebenezer Lutheran Church, St. Louis.